Rebecca has kept us all in suspense for the last week wondering when the first egg would be laid. She was in and out of the nest box all the time and certainly acting as if it was time to start the season. 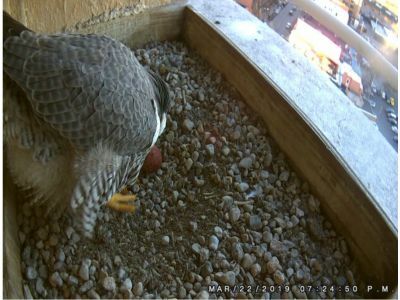 For the last two years, her first egg was laid on March 16, which was earlier than any other Peregrine in Michigan. This year the arrival on March 22 at 7:24 PM was more in line with earlier years and with other birds around the state. The Warren MI Peregrines (Isabella and General Brock) also welcomed their first egg on March 22 and beat Rebecca by several hours.